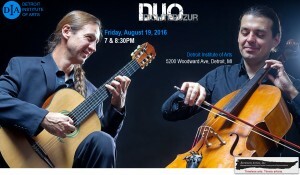 Following spring season dates at Penn State Behrand, the Benderly Concert Series in Arizona, the Flickinger Center in New Mexico and more, the Richter Uzur Duo brings their original takes on classical works, Eastern European folk tunes and chamber pop/rock arrangements to the Detroit Institute of Arts. Viktor Uzur and Brad Richter are each master musicians of the highest caliber with global solo careers. Since the “RUDuo” was founded in 2005 they have discovered a way to blend all of the musical styles they love and audiences have as much fun listening to the results as Brad and Viktor have playing.